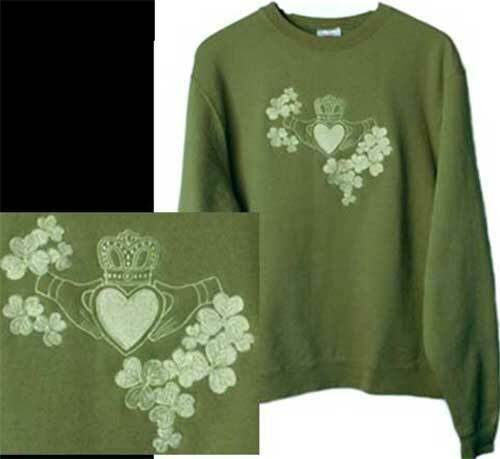 Irish sweatshirt features a woman's design that is enhanced with an embroidered Claddagh and shamrocks. This pullover women's Irish sweatshirt features an 80/20 shrink resistant cotton blend. This Irish sweatshirt for women features a beautiful original Claddagh and shamrock design that incorporates over 50,000 embroidery stitches. The result is this gorgeous, subtle, and so wearable ladies' sweatshirt in a color named warm green. This women's Irish sweatshirt is embroidered in the United States and it is received with the Claddagh legend along with a shamrock history card, compliments of The Irish Gift House. This Irish sweatshirt is only available in limited sizes. Irish sweatshirt is a women's French terry V neck that features the Claddagh along with shamrocks and Celtic knots. Women's Irish sweatshirt features fully embroidered shamrocks along with the Claddagh.